EXECUTIVE SUMMARY: Contrary to the accepted wisdom regarding the effectiveness of barriers, there is no substitute for troops on the ground and for civilian settlements that anchor a dominant presence. Israel needs a flexible, dynamic form of security in full friction with the resident populations. An Israeli withdrawal from the West Bank would therefore be ill-advised, and a Palestinian state would in any case inherently undermine Israel’s security. The best hope for both parties is coexistence within the same geographical space. This is an edited version of an article that appeared in the Autumn 2016 issue of Fathom. Providing security for a nation involves two aspects or questions. One aspect is the practical matter of how best to defend a country’s existence. This has primarily technical components, such as the location or height of a barrier, and is a matter for experts. But this is preceded by a core question that is intended for philosophers, prophets and leaders, and is based on values and worldview. That is the question of what a country is defending. In other words, what is its essence? What is its reason for existence? Nations should be constantly trying to maintain equilibrium between these two sets of considerations. The ‘values’ question as it relates to Israel’s defense – the question of the purpose of a nation’s existence – was on display in April 1948. The situation for the yishuv, the Jewish community in Mandatory Palestine, was dire. The Negev as well as communities in the north were under siege, while convoys were unable to reach Jerusalem and Gush Etzion. Faced with these threats, David Ben-Gurion decided to focus the main operational effort of his forces on Jerusalem. This decision was influenced not by the technical recommendations of his military experts, but by Ben-Gurion’s worldview as a Jew regarding the city’s centrality. It hearkened back to the Jewish oath reflected in Psalms never to forget Jerusalem. A leader should not, of course, ignore what the experts say, but ultimately his thinking must be influenced by the nation’s values. There is no simple equation for how to achieve this balance. One cannot discuss the defense of Israel without first touching on what it is being defended for. We Israelis are not here simply to live securely, soothed by promises that America will always protect us. If all I want is security for Israel, I might as well bring the entire population to Tel Aviv and build a huge fortress. For that matter, we could just move to Palo Alto, which has a better quality of life and greater opportunities. A US general once told me that “at the end of the day, everyone wants the same things – restaurants that are open until midnight and kids who can get safely to school.” He deeply misunderstood me, because I can get all of that in New Jersey. Jews in Israel may have swapped the threat of pogroms in Kishniev for the threat of Iranian nuclear weapons. But when discussing security, it is important to emphasize that there is something beyond safety, something that lies in the realm of values and vision. I believe the essence of Zionism is to live in the Land of Israel, the land of our forefathers. We did not come here only for a Jewish majority or even for mere sovereignty, but simply to live in this land. Some say that Israel’s West Bank security barrier prevents terror attacks on population centers. But when the Palestinians are on the other side of a fence, an even worse security situation is created. A fence is a closed system. Protecting it requires routine patrols and cameras. Every mechanical system has points that can be bypassed. (In fact, a reason for the delay in building the security barrier in the south Hebron hills was that parts of it were stolen). An enemy that understands a defensive fence can get around it. I prefer a more open, flexible, dynamic form of security activity. Such a system facilitates creativity and surprise, making it impossible for the enemy to predict the movements of the Israel Defense Forces (IDF). This involves constantly changing one’s pattern of activity, or altering the locations of checkpoints (and on some days, not having any at all). It encourages the IDF to take the initiative and prevents it from becoming too passive. Many Israelis believe that if we erect a fence, our problem with the Palestinians will suddenly vanish. But the problem on the other side of a fence often gets worse. Take Gaza, for example. Since the evacuation in 2005, Israel has been without any effective intelligence presence operating in Gaza. Rather than protecting Israel, the fence that contains Gaza actually restricts Israeli operations. The withdrawal of an Israeli presence from Gaza and reliance on the barrier shows that the moment Israel builds a fence and ceases to operate on the other side, it allows the Palestinians to create a well-structured military force. Such a force, which now includes Hamas battalions, brigades, and command and control headquarters, can only be destroyed by war. By contrast, if Israel receives information about, say, a bomb laboratory in the West Bank, it can simply enter the territory with two jeeps and arrest the suspected operatives without starting a full-blown conflagration. Israel’s presence on the ground in the West Bank also makes it harder for Hamas to organize there. A Hamas activist based in Hebron is rarely in touch with his commander because the group has been forced to create heavily compartmentalized units in which members and operations are only revealed on a need-to-know basis. The moment Hamas begins to plan an attack in the West Bank, the IDF can act to prevent it. In Gaza, Hamas is far more organized. It has a headquarters from which it can plan, train for and carry out attacks against Israel. The current reality in the West Bank lies somewhere between war and peace. It is not stable, but it is not radically unstable, either. It closely resembles the form of life experienced by most residents of the Middle East. The low-level daily friction that pertains from the current situation in the West Bank is better for Israel than either of two alternative scenarios. The first alternative is a situation of temporary periods of quiet followed by serious war that causes significant damage to both sides (as occurred in Gaza in Operation Cast Lead in 2008-09, Operation Pillar of Defense in 2012, and Operation Protective Edge in 2014). There is now a closed fence around Gaza, and everything has become binary. The entire area by the border is now built up. The fence around the Strip means that everything near the border is well-fortified, making it harder for the IDF to attack. Hamas knows exactly where the IDF will enter from. Security as a dynamic movement has been completely lost. Instead, the IDF is required to rely on air power. This situation – which does not apply in the West Bank because Israel still controls it – is the big disadvantage of the separation approach; what some on the Israeli political left call the ‘we’re here, they’re there’ approach. In 2006, I worked alongside an American general to determine how an army can maintain surveillance without a physical presence. The Americans initially believed that intelligence and operational superiority, coupled with Remotely Piloted Vehicles (RPVs) that can strike from afar, would be enough to create dominance without the need to put “boots on the ground.” But the opposition was quick to adapt and went underground. This happened to Israel during Operation Protective Edge. Hamas’s leaders in Gaza disappeared, neutralizing Israel’s superiority. Nowadays, most of Hamas’s rockets in Gaza are stored underground, and Israel finds it difficult to defend itself against rockets launched from Gaza towards Ben-Gurion International Airport and Tel Aviv. One of the big challenges emanating from Gaza is weapons smuggling. Even the Egyptians, who are in the midst of a battle with IS in Sinai, have been unable to stamp out this phenomenon. One rocket-propelled grenade (RPG) entering the West Bank would require changing the IDF’s entire modus operandi. Israel would no longer be able to enter refugee camps in trucks and would be forced to rethink how it buses children to school. The only way to prevent smuggling into the West Bank is to control the Jordan Valley and implement inspections. This has to be done by Israel; we do not want Americans dying in order to protect us. Yet in order to securely hold the Jordan Valley, the IDF also needs to maintain a presence further to its west, on the mountain ridge along the eastern watershed of the Samarian and Judean mountains.This area includes the Jewish settlements east of Nablus, such as Elon Moreh and Itamar, as well as the Alon Road. Holding the Jordan Valley without simultaneously controlling the mountain ridge would render the IDF incapable of properly defending itself. Nor would it provide even minimal strategic depth. Before the Gaza disengagement, then-Prime Minister Ariel Sharon debated whether to maintain a residual IDF presence along the Philadelphi Corridor (the strip of land between Gaza and Rafah in Egypt) in order to prevent smuggling. He ultimately decided against this because, just as in the Jordan Valley, the corridor was too narrow to provide sufficient protection to the soldiers who would have been stationed there. In his book The Utility of Force: The Art of War in the Modern World, British General Rupert Smith describes a new paradigm of conflict that he calls “war amongst the people.” Smith argues that rather than being defined by clashes between uniformed armies on a battlefield, the defining character of warfare today is that it is increasingly fought between parties who are among the civilian population. Traditional experts disagree with me that warfare has changed significantly. But this is like the difference between theater in the time of Sophocles and 21st century cinema. One can argue that they are both ‘theater,’ but the two are completely different, with all manner of new tricks that can now be brought to the stage. Rather than the more static classic separation between defensive and offensive operations as described in the works of Clausewitz, a better model through which to deal with this new type of warfare is the hybrid dynamic movement model. This so-called post-modern warfare is reflected in separatist fighting in Donetsk in Eastern Ukraine, as well as in other areas of the Caucasus where civilians are on the front lines. Comparable aspects to this type of ‘in and among the civilian population’ can be seen in Judea and Samaria. The IDF only has 10,000 troops in the West Bank, but the mass presence needed for security is in fact provided by Israeli civilians. Without them, Israel would be unable to ensure its security. 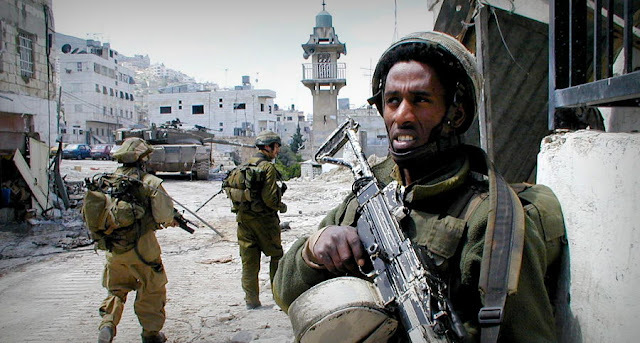 In fact, before the disengagement from Gaza, the Israeli settlements – in the north, center and south – contributed to Israeli security by allowing Israel to better defend itself from attacks originating from Gaza. The fulfillment of the Palestinians’ national aspirations clashes with Israel’s security because a sovereign Palestinian state would endanger Israel. Even if a Palestinian government tried to maintain a peace agreement, there would be rejectionist groups that tried to undermine it. One mortar hidden in a car and launched towards Ben-Gurion airport would be a disaster, and this scenario is a real possibility even if a Palestinian government tries to prevent it. Moreover, in today’s world, anyone can build homemade weapons with dual-use civilian materials such as iron pipes and chemicals, using instructions found on the internet. Even a cell phone can be used for this purpose, as the Americans learned in Iraq through the use of improvised explosive devices (IEDs) against them. The main idea behind the two-state solution is the creation of a binary order in which two separate areas exist with no interaction between them. When Haim Ramon and Ehud Barak advocate the ‘we’re here, they’re there’ concept, they are trying to convince the public to accept the Oslo Accords even without the rosy vision originally promised of a new Middle East. Instead, they advocate separation on the grounds that Israelis won’t have to see Arabs anymore. But the forced, binary separation between Israel and a state of Palestine in the West Bank and Gaza would be a technical rather than an ‘architectural’ solution. It is entirely artificial. A good example of an architectural rather than a technical security solution occurred immediately after 1948. Following the armistice agreements between Israel and Jordan, the old railway track to Jerusalem (which is on the Israeli side of the Green Line) touched the Palestinian village of Battir on the Jordanian side. This raised a security challenge. A purely technical approach to the problem – the sort of approach Israel would likely take now – would have been to build a huge fence. Instead, Moshe Dayan came to an understanding with the villagers under which they were granted permission to have direct access to their farmland (on the Israel side) in return for ensuring the security of part of the train line. Such complex human systems are all about balance. Total solutions only appear in mechanical systems. I believe Israelis have no choice but to live with Arabs. I also believe that a hybrid phenomenon, what I call ‘emerging equilibrium,’ is developing between the Jordan River and the Mediterranean. This equilibrium reflects a new order and offers much hope. An example can be found in Nazareth, in northern Israel. Two national entities share the same geographical space but are arranged in such a way that each has places that reflect their own state or people. Jews and Arabs in Nazareth coexist and work together, but their ways of life – their shops and food and so on – are organized differently. If we allow greater numbers of Palestinians to enter Israel to work, and try to facilitate daily interactions that create life connections between people, this type of model can ultimately emerge within the entire Land of Israel.